In 1996, Levi was in the U.K. and the Cardinals battled the Braves in the NLCS. The Braves beat the Cardinals 14-0 in Game 5, and then 15-0 in Game 7, becoming the first team to win the NLCS after being down 3 games to 1. So I mailed Levi, across the ocean, a sympathy card with a few news clippings enclosed. This year, shortly before Game 4 of the World Series was about to begin with the Cardinals already down 3 games to 0, I stopped off at the drugstore and bought a sympathy card. There was no reason to include news clippings this time, so instead, so it was more than just a card, I broke out my disused colored pencils to do some illustration, making a certain logo into a sad and tearful Cardinal. I was finished by the sixth inning, and we all know what happened next. I put it in the mail the next day. The preprinted message on the right reads “Although no words of sympathy can ease the loss you bear/Still, may you find some comfort knowing others truly care.” Appropriate, huh? The message I wrote on the left reads, “Well, we’ll see what happens in the next 86 years… (signed) Jim.” There was a raised illustration of a bouquet of flowers on the front of the card, so I couldn’t draw on the bumpy surface on the left side (which I didn’t think about when I was buying the card). I think I did a pretty good job, except for the fact that I somehow managed to end up with the cardinal leaning backwards. It’s more straight up-and-down in the real Cardinals logo. Levi: I don’t know that this presentation does the card justice. The crying Cardinal looks very, very sad. 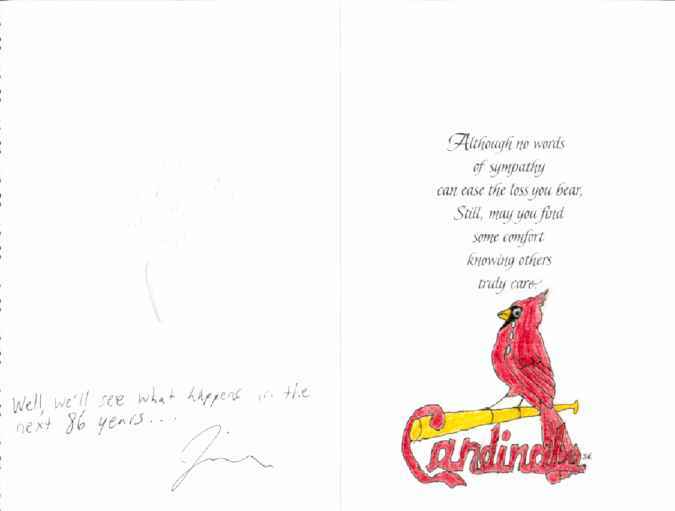 But Jim, does the fact that you were working on this card during the final game mean that the Cardinals’ loss is your fault? Jim: I was watching the game TiVo-delayed, so nothing I did could possibly have affected the outcome. At least that’s my excuse. Jason: It looks like the Cardinal is about to fall backwards off the bat in despair. And nice lettering job! Could you now draw a happy Devil Ray to celebrate the escape from the AL East cellar?